Positive reinforcement shapes behavior and enhances self-image. TALK TO US is an interactive portal that allows anyone in the company to share first hand experiences on positive events or actions. Recognizing and facilitating internal communication is essential to motivating employees in today’s workplace. Your employees encounter safety issues in the workplace daily. They range from working conditions to human behavior. 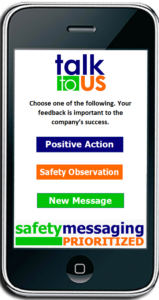 TALK TO US allows employees an opportunity to relay any unsafe act or situation they observe and allow for immediate corrective action. A successful safety environment is developed from the bottom up, not the top down. Safety Messaging is your company’s platform. TALK TO US allows for two-way communication. It gives your employees a voice in creating the best platform possible by incorporating their experiences and recommendations. The sharing of these messages within the company creates an internal partnership and proactive safety environment.